You are experiencing something weird with Windows 10. You have an activated Windows 10 that is asking for activation. You are still getting notifications that you need to activate it. It is an annoying situation especially when you know you purchased a very good copy of Windows 10. Here are troubleshooting steps for removing the recurring notification on your Windows 10. Once you get the product key, compare with the one listed on the System Information window. If it is the same, go back to the activation window and click activate once more. Otherwise click Change product key, enter the new one you just got and select Activate. If you get an error code after doing this, then check if you received an error message. Find out about related errors in this article. Taking out the existing product key and entering a new one may do the trick. After this, restart your computer and then try to activate Windows again. 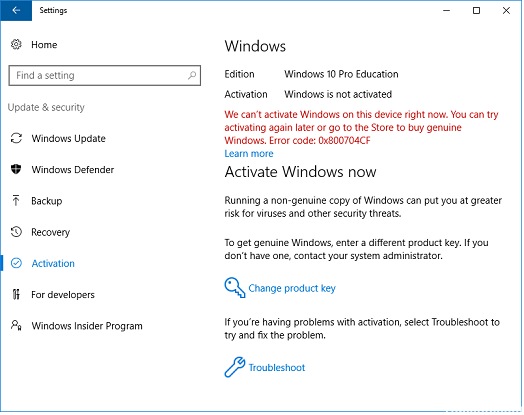 The Windows Activation Troubleshooter is a tool available to you to help you resolve most commonly encountered activation issues on Genuine Windows devices. This includes hardware changes related errors. This is the process of validating software with the manufacturer. You will need assistance from actual MS Tech Support to do this. You will need a Microsoft Account to do this. Create a new Microsoft Account and use it to log into your Windows 10 computer. While logged in, Activate your Windows 10 copy. You will receive a Windows is activated with a digital license message. By linking your Windows license to your Microsoft Account you are able to resolve the problem. If not, run the Activation Troubleshooter. Contact Microsoft Support, you should be able to get to the right tech support line by following the activation process by phone. Explain your situation and the support agent will verify your Windows 10 Product Key and then give you an ID for activating Windows 10 on the new computer. If you are having other issues with this, comment below so we can find out the answers together.